WARSAW – No matter what Northridge threw at Warsaw Friday night, the Tigers found a way to dodge it. Warsaw used a consistent effort from its starters and solid bench contributions to knock off the Raiders, 67-56, in boys hoops action in the Northern Lakes Conference. Another big night from Trevor Rumple off the bench for the Tigers allotted for 18 points on 7-8 shooting and a lot of opportunistic moments. Wyatt Amiss also had major minutes and more production, going 6-8 from the floor and posting 17 points, five of those makes from behind the three-point line. “Wyatt Amiss and Trevor Rumple took a trip down Splash Mountain at the same time,” said Warsaw head coach Doug Ogle. Rumple got going in the second quarter, scoring seven points and leading Warsaw into the lockerroom with 10 points, but really made his presence known in the fourth quarter. After Nolan Groninger dove in for a layup, Rumple jumped Northridge’s outlet route, got his own miss, and banked in a two. The play was a highlight of a burst that put Warsaw up 57-44 after Northridge had sliced Warsaw’s nine-point lead to three early in the fourth. Groninger would end the game with nine of his 13 points, and Tyler Metzinger toed the line for most of the second half, playing with four fouls for most of the fourth quarter, but concluded with 10 points and five rebounds. His work, along with Jaylen Reese, on Ridge big man Alex Stauffer was part of the primary reason why the Tigers are sitting at 2-0 in the NLC. Stauffer entered the night averaging a shade over 11 points and six boards a game, but finished his night with a harmless seven points and four rebounds on just six total shots. Erekson wouldn’t approach his usual output either, scoring just 10 points and only had two points in the first half. Erekson, who is one of the top scorers in the conference at 17 points per game, also didn’t get to the free throw line Friday night. Sam Vogt, who had only hit six three-pointers to date before the Warsaw game, hit four and led Northridge (5-6 overall and 1-1 in the NLC) with 16 points. Carter Stoltzfus added eight points for the Raiders. Warsaw’s JV (9-2) didn’t hold a lead in the second half until a Jackson Dawson shot fell, giving it a 41-39 lead en route to a 47-42 final over the Raiders. 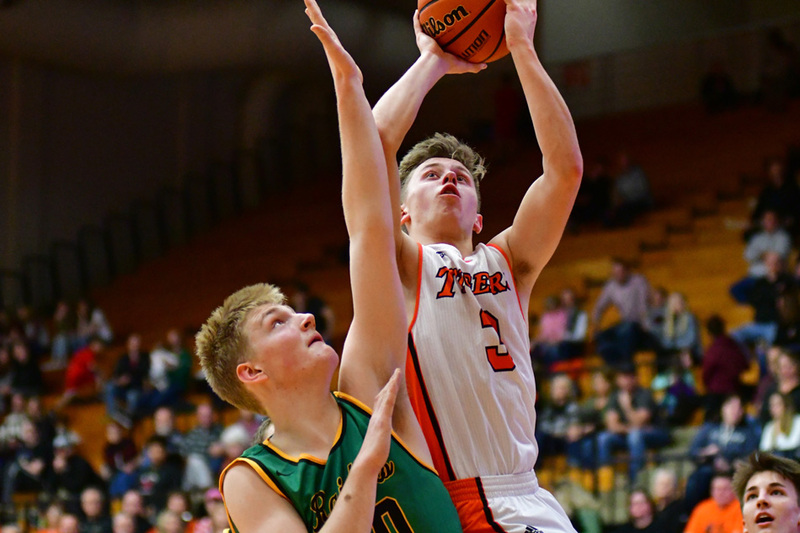 Bishop Walters was the high man for the Tigers with 19 points, Ben Bergen added nine points, seven rebounds and three assists, and Brock Poe scored all eight of his points in the second half. Drew Gayler had a double-double of 19 points and 10 rebounds for the Raiders. Warsaw (7-4, 2-0 NLC) will visit Goshen next Friday.